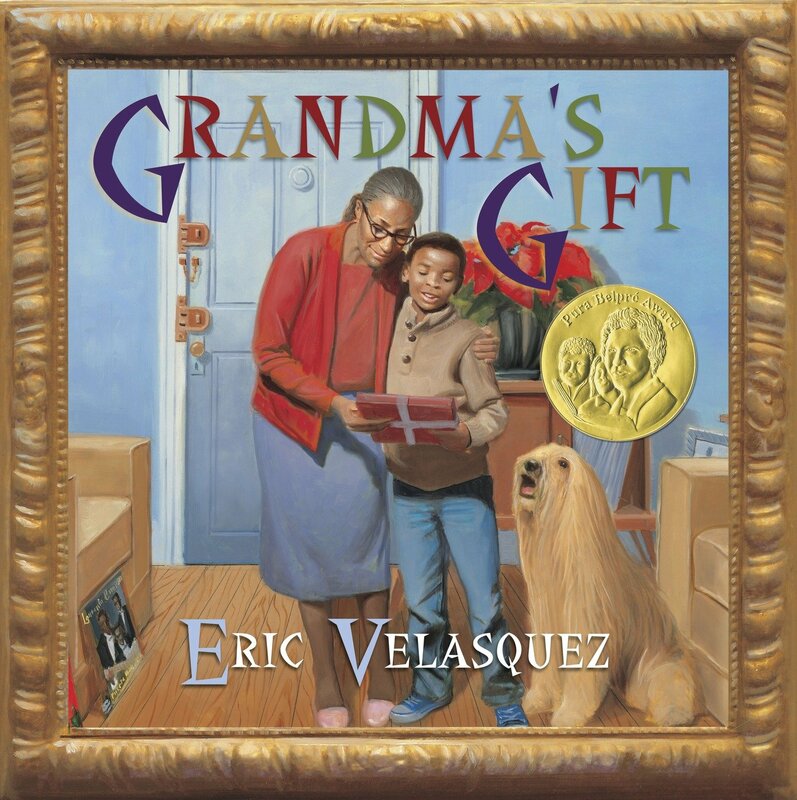 Eric Velasquez is the award-winning illustrator of more than 25 children’s books, including three that he wrote. In Grandma’s Gift and Grandma’s Records (Walker, 2001), he brings to life childhood moments that illuminate the warm and meaningful relationship he enjoyed with his grandmother, a native of Puerto Rico and resident of El Barrio (Spanish Harlem). In a category where such books are woefully rare, both of Velasquez’s Grandma stories represent positive images of Afro-Latino children and their families. Although the story in Grandma’s Gift takes place inside a few square miles of contemporary New York City, it also casts a spotlight on a long-ago historical figure. 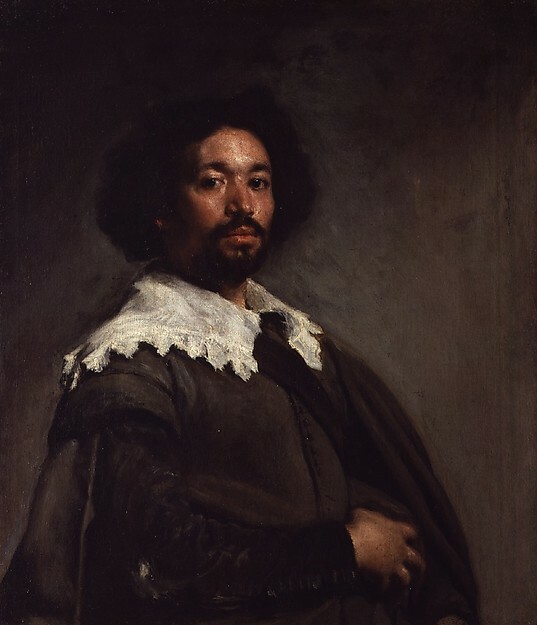 Juan de Pareja was an enslaved man of African descent who worked in the studio of 17th-century Spanish master Diego Velázquez and who became a painter in his own right. When the author was a boy, Velázquez’s luminous portrait of de Pareja was acquired by the Metropolitan Museum of Art for a price exceeding $5 million. Grandma’s Gift contains two additional distinguishing aspects: elements of Puerto Rican culture passed down by the boy’s grandmother, and contrasting views between two physically proximate but culturally distant worlds, represented by El Barrio and the Metropolitan Museum of Art. As the story begins, Eric is leaving school for Christmas break, in the company of his grandmother. His school assignment, to be completed during the holidays, is a visit to the Velázquez exhibit. But first, grandmother and grandson go shopping at La Marqueta, once a central feature of El Barrio, composed of bustling shops tucked under a railroad trestle. At La Marqueta, it’s evident that Eric’s grandmother is a respected and beloved member of the community. Not only do butchers and greengrocers call her by title and name—Doña Carmen—they are also familiar with the high standards she expects from every cut of meat and vegetable she purchases. When the shopping is done, Eric and his grandmother return to her apartment, where she launches an elaborate preparation of traditional Puerto Rican holiday dishes. Here, she is clearly in her element, deftly handling each step of the cooking, filling, and rolling of the pasteles, much to the admiration of young Eric. Nearly all of Doña Carmen’s dialogue is parenthetically translated into English, immediately behind her Spanish words. While this solution is not particularly elegant, it reflects the challenge that authors and publishers face in including authentic representations of a Spanish-speaking environment within an English text. The story translates greetings in Spanish by shopkeepers, words of wisdom spoken by the grandmother, and details relevant to the story, such as the names of the root vegetables used in making pasteles: calabaz, yautía, plátanos verdes, guineos verdes, papas. El Barrio is a place that Eric’s grandmother comfortably navigates day after day. Here, her native tongue predominates, and everyone is a shade of brown. But when she and Eric head for the museum, a short bus ride away, they leave behind that familiar environment and land before the facade of the Metropolitan, cloaked in cultural status and imposing architecture. As Eric notes, there’s no one “from Puerto Rico on the streets and no one was speaking in Spanish.” At this point, Eric becomes her guide in this English-speaking world, translating the signs and captions that they encounter, stepping into a role that second- or third-generation immigrant children often play in their elders’ lives. The highlight of the story arrives when Eric comes face to face with the portrait of Juan de Pareja, hanging in its gilded frame in one of the august exhibition halls of the museum. As a young person of color in the 1970s, Eric has never seen any of his own people elevated to such a status: “He seemed so real—much like someone we might see walking around El Barrio. I couldn’t believe that this was a painting in a museum.” Eric is amazed and proud to learn that Juan de Pareja eventually achieved freedom and became a painter in his own right. For Eric, this discovery is a revelation that sparks an artistic fire. On Christmas Eve, after everyone enjoys a traditional holiday dinner, Eric sits under the Christmas tree and opens his grandmother’s gift. It’s a sketchbook and a set of colored pencils. He immediately begins to draw a self-portrait. Through this gift, Eric’s grandmother expresses confidence in her grandson’s dreams, underscoring that he, too—a child of El Barrio, an African Latino—can follow in the footsteps of Juan de Pareja. This touching, autobiographical story is richly illustrated in Velasquez’s photorealistic style, which authentically depicts settings and brings dimension to each character. He imbues his subjects with individually distinct physical characteristics, and lovingly paints his grandmother as a lady of dignified bearing and warmth, usually dressed in subdued colors. He often lavishes this humanizing treatment on background characters as well, such as fellow passengers on the train and a nameless guard at the museum. In most of the illustrations, he employs a wide and vivid range of hues, but like Diego Velázquez, he sometimes falls back on a deliberately limited palette. When the boy and his grandmother stand before the portrait of Juan de Pareja, most notably, the rich browns of the ancient oil painting harmoniously come together with the rich browns of the grandmother’s clothing, as well as the skin tones of all three figures. He puts this deft touch with a monochromatic palette to great effect in the story’s electric moment of revelation, as the child Eric looks on the portrait of Juan de Pareja and grasps a new possibility for his own future. Grandma’s Gift is truly a gift and is highly recommended. An earlier version of this review first appeared in Latinxs in Kid Lit (latinosinkidlit.com). We thank Latinxs for permission.